Previously on Agent Carter, Peggy knocked someone out with a STAPLER and that’s all you need to know about how amazing this show is. Some plot stuff also happened, mainly Peggy teaming up with human Jarvis, a shifty organization called Leviathan is developing weapons, a factory got blown up, and a mysterious symbol was drawn in the dirt by a member of Leviathan before his death. In this episode, SHIELD has tracked the bumper and plate of the car Jarvis was using to Howard Stark. He gets stuck in a holding cell, being interrogated, while Peggy is helpless to watch, lest she blow her cover. She also ends up getting chewed out by her boss, and the shot after she leaves her office is effective and oppressive – she’s looking into a sea of suited men who stare at her, go back to their work, and you can feel Peggy’s discomfort. There’s also an uncomfortable scene between her and her roommate which is super stressful because she wants to hang out with Peggy, but Peggy needs to go out and can’t tell her why. I felt bad for both of them. I really love Peggy and Jarvis’s relationship. They play off each other so well, and I love every bit of banter they have. A lot of this episode is them together, like the last two, so I’m glad this is reoccurring. I also really like the music on the show. The episode ends on a rather somber note. This week’s episode felt a bit slow and like not much happened, especially for a show that’s only seven episodes, but I’m still looking forward to next week! I love the writing, the fashion, and the acting is excellent from everyone. I’ll be watching Supernatural live instead of Agent Carter, so the review will come later. 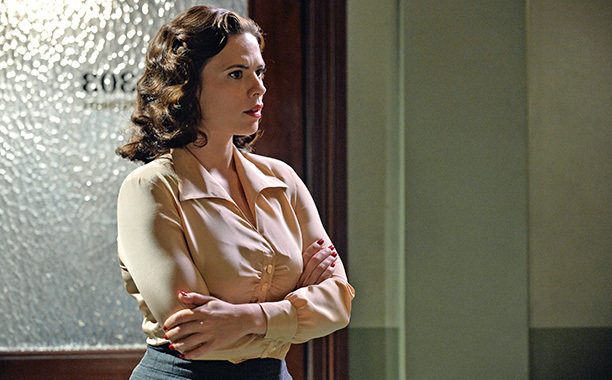 Watch Agent Carter Tuesdays at 9pm EST on ABC. It will be back on 1/27!